Well, mine for the time being anyway. I live in Mussoorie, Uttarakhand, India. And this is my tour. Woodstock is on a mountain above the town, so when visiting town, we typically walk down the mountain, along the long winding road, to Mussoorie city center. Then, when we are ready, we catch a cab back up. Because this is a mountain, people, and walking up to Woodstock from Mussoorie is no laughing matter. One of my favorite sci-fi authors hypothesizes that cities will eventually stop centering around city centers and instead center around large, high speed transit. So that instead of there being a downtown Austin, with the rest of the city emanating in all directions, you would have the Austin-San Antonio Corridor, with the city spreading out from the highway about three miles in each direction. A cool idea, and one I think is slowly happening. Mussoorie is already there. No because of technology, but when you live on a mountain with one road that twists and turns downhill, every darn thing you need is on that one road. Look up from the road. Mountain. Look down. Steep, steep drop. From Woodstock, you walk into town on a blessedly flat road. You pass Cozy’s Corner, a small food stand that, while open every day, survives almost entirely on the Woodstock students who are only allowed to visit on Saturday. You keep walking and you pass the Landour General Hospital, so high up the mountain that it would cause a heart attack to climb it. Near the hospital are the first batch of shops and tea stands, and the “English Wine Shop” which sells one type of low grade alcohol, neither wine nor English. Drinking is not big here. Further down is the first batch of makeshift houses, consisting of tarp and cardboard, and holding more tiny children that one could possible imagine fitting into the space. All in all, I think about thirty people and 10 puppies live in this cardboard complex. Dogs roam freely everywhere. No one owns them, and they go where they like. I should mention that the views along this road are breath-taking, especially in the monsoon when the clouds are beneath you, and you can only see the occasional house or summit peek out through the mist. Then you hit our tailor, Mr. Faiz. Mr. Faiz is cool, and not because he will make you any kind of clothing you want, in only a couple of days, for ultra-cheap. He is just a nice guy and is good for some good conversation. He made my Indian Independence Day attire, and will soon be making me a backpack. Another few steps and you hit our movie guy. He sits in a kiosk and sells illegally pirated movies, $2 for six films. It would be a better deal if the movies were not videotaped in front of a screen in Russia, with people constantly walking through the frame. The weird thing is that, while it would be super easy to just burn movies off of a bit torrent and sell those copies, he is part of a syndicate and would not dream of actually burning a movie himself. From the movie guy, there are lots of shops and Indian version of fast food, but nothing we visit on a regular basis. The village gym is here, and a shoemaker with pretty red walls. The woman folk bought their glass bangles from a shop along this strip. So you walk for a ways, get highjacked by the Kashmir goods merchant, and the road flattens out for a bit. The road is narrow, and the sounds of honking horns fills your ears as they argue trying to make one person back up so the other can go through. We pass tons of shops, the road tilts down again, and we pass one of our vegetable vendors, who sells from a dark, basement-type room, but has good food and won’t quote us insane, white people rates (only slightly bonkers white people rates). We pass the “paper” store, where Gavin blows a lot of his money on small toys and posters. The iron man is close by, where we buy pots and pans and pay for them based on the weights of the iron used. The samosa place is also here, which makes the most amazing samosas, piping hot, right in front of you, for Rs8. About $.17. Nirvana. Sidarchi’s is next, and I am sure I am destroying that name, but he is our grocer. The nice man who delivers food to our house a few times a week and puts it all a tab that we pay once a month. I am amazed he trusts us. But he has the good stuff, like cereal, Digestives, and corn. Next is Goyal’s, the electronic store, where we bought our stove, also on a tab. Weird, thing this tab business. Goyal’s is at the beginning of Monkey Road, my own little name for a stretch of the bazaar where one side is just too steep for a building, so it is still a jungle, and overrun with monkeys doing their best to steal fruit and pretty cloth from the vendors below. At the far end of Monkey Road is Golden Restaurant, really good, cheap food. And Clocktower Cafe, a really expensive restaurant for tourists, which occasionally fills our need for American or Italian food. (OK, once, and still no beef). The Clocktower Cafe sits next to what was until a few months ago, the jewel of Mussoorie, a huge clocktower that towered over the rest of the buildings. A relic from Raj tourism days. Sadly, a few months before we arrived, the Clocktower was torn down. 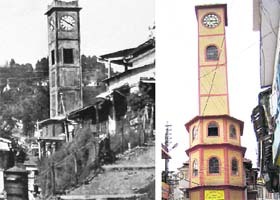 The story, as told to me by a cab driver, is that some rich, crazy guy, who lives part time in Mussoorie, decided to build a new, monstrous clock tower, one that would “rival Big Ben.” So he tore the old tower down before asking for permission. A slowly decreasing pile of rubble is all that remains. From the clocktower, you are almost at The Mall, the main Mussoorie bazaar. It begins at the ruins of Picture Palace, a sadly defunct movie theatre, and continues on down the mountain. For my family, this is often the end of the line. We wander a few shops into The Mall, to the Tavern. The swanky restaurant that serves beer and everything at a steep cost hike. But we come here for the yummy food, the root beer, and the Electric Blue, a “mochtail” concoction that is lime soda with some additive that makes the drink bright blue, served with a blue paper umbrella. Gavin’s idea of heaven. Lots of stuff further down. Greens Veg. restaurant, the Dentist (sorry, Oral Health Resort, which, to me, sounds… well, never mind), lots of small magic shops (a tourist staple here), and dozens of other knick-knack type places. But this is not really our neighborhood anymore. At Picture Palace, we haggle with the drivers, pay our Rs100 and drive back up the mountain. Our little village in India. You’re going to be in pretty good shape by the time you come back stateside, with all that walking and everything. Hi, was told about your blog by a friend who attended Breadloaf with you. I both studied at WS and worked there for several years. What you see below is from my reply to her. Was disappointed to read that Clock Tower has been torn down. Why would they do that? To build something that rivals Big Ben? Give me a break. Some fool in the municipality office made a lot of money. The buildings “below the road” – (left side of the photograph) are new. That must have taken some doing as they would have had to build access roads or paths first. The older buildings on the right look exactly as they did when we were in Mussoorie. There is no mention of the old bulls that used to roam the road in the part of town that he describes. I suppose they died years ago. Shame. Nothing like a bull in the middle of the road to hold up traffic. Waiting to read about the “top of the hill” and the Library and Happy Valley parts of town. I was still new to town when I wrote this, so the hospital seemed pretty high to me. I am in slightly (only slightly) better shape, and could now climb it without a heart attack, but still with a large amount of huffing and puffing. There is an English Wine Shop directly across from the hospital, not sure if it is breaking any laws or not, as laws seem a bit fuzzy here anyway. The clock tower destruction has infuriated the town, and no sign of building a new one is apparent. Thanks for your response William. You guys must be getting ready for “going down day”. Is it still the convoy of buses from WS to Delhi? I’m sure we’ll find everything way up the hill if we return to Mussoorie now after being away 20 odd years. One thing we liked doing (as staff) is organize “watch the moon set and sun rise” breakfasts on this little piece of flat land on top of the hill. Quite close to where the Alters live(d) — have forgotten the name of the spot. Do you still do that?